"I was appalled that mass atrocities like this were happening in Europe in the 1990s," he said of the genocide he observed being perpetrated by the Bosnian Serb army. "Every time this happens, the international community says this will be the last time. And yet mass atrocities continue to occur." "Once you work on something that powerful, you don't really have an appetite to do anything else," said Marx, a recognized expert on using satellites and other spatial data, such as crowd-sourced mapping to analyze and inform human migration and refugee policy. At USC Dornsife's Spatial Sciences Institute (SSI), Marx runs the Human Security and Geospatial Intelligence Lab, leveraging new, "smallsat"—short for small satellite—technology to detect human rights abuses and violations. The information collected by this technology provides evidence that can be used to corroborate refugee accounts of atrocities in international courts. Many of the world's worst human rights abuses, including genocides, occur in areas that are difficult to observe, Marx notes. Satellite technology is often all that's available to monitor what's happening on the ground. While smallsat technology can provide daily imagery of the entire Earth, the images are too fuzzy to visually identify details that can signal human rights abuses. Marx and his team, comprising several undergraduate research assistants, are overcoming this obstacle by designing algorithms to automatically detect potential human rights violations—such as villages that have been burned down. 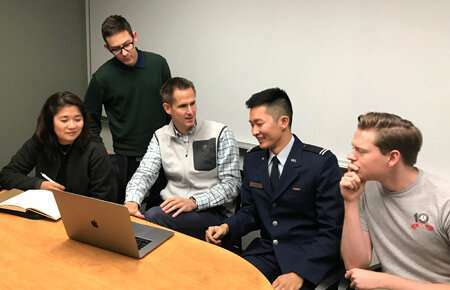 Andrew Marx (center) meeting with members of USC Dornsife’s Human Security and Geospatial Intelligence Lab. Research assistants in the lab work from the USC campus as well as remotely from Washington, D.C. and the Netherlands. 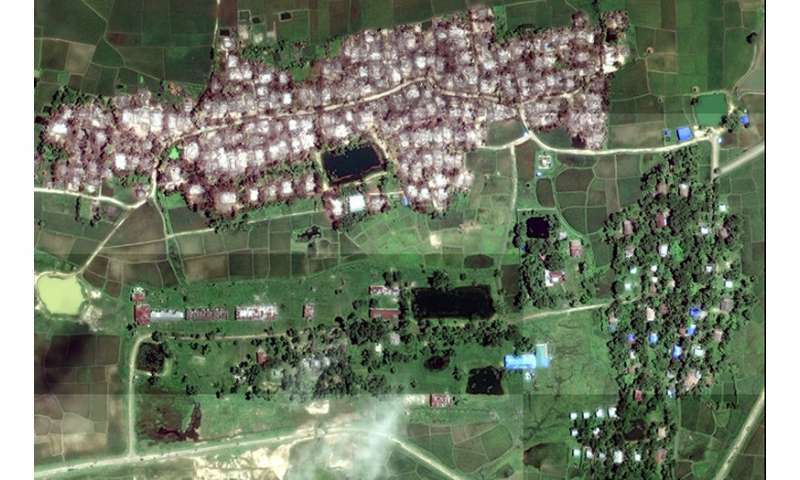 The spatial scientists are working with Human Rights Watch and Physicians for Human Rights to monitor the situation in Myanmar, where the Rohingya Muslim minority is being persecuted. Huts in this region have roofs made of dried plant material that reflects infrared light. Marx and his team developed techniques that make it possible to detect changes in reflected light from one day to the next. When huts in a village are torched or otherwise destroyed, there is a corresponding drop in infrared reflectance that signals an attack on that village. The Myanmar army has denied not only the ethnic cleansing but the very existence of the Rohingya, and the Myanmar government has continuously denied abuses. "Satellite imagery provides data that cannot be refuted when used in conjunction with geospatial intelligence and victim testimony," Marx said. "We cannot stress enough the importance of refugee testimony; however, at times further evidence is required. Our methods strengthen the evidentiary power of victim accounts." Marx's goal is to develop an early warning system to prevent human rights violations. Marx points to Darfur in western Sudan, where up to 400,000 people have died in ethnic cleansing programs, allegedly ordered by President Omar al-Bashir. This systematic killing has become known as the first genocide of the 21st century. "If we can monitor areas likes Darfur using daily imagery, the international community can learn what's happening very early on, and then we can stop isolated attacks before they turn into a large-scale genocide," Marx said. The team hopes to one day give the technology to organizations like Amnesty International to reduce human suffering, Marx said. Marx and his team are also hoping to make their service available to the public, so anyone can log onto their website and see which villages may have been attacked in the past couple of days in different areas. "The students who work in my lab are passionate about human rights—as am I," Marx said. "While you can't replace the power and importance of testimony, I want my students to be able to leverage new technologies and approaches to combat these terrible atrocities that are still occurring worldwide. "We're optimistic that we can make a difference." Why has the genocidal murderer Suu Kyi been allowed to keep her Nobel Peace Prize? Was Hitler considered for a peace prize? Did Stalin just miss out? Is Kim Jong Un in the running for the next one? ?